While away on our 10,000 km adventure in August, my wife and I made a pilgrimage that is not to be missed when in western Canada: we stopped at Morant’s Curve. To be more accurate, we stopped there twice: once on the way to the Okanagan, and once on the way back. “What’s significant about Morant’s Curve?” you might ask. Good question! Any Canadian railfan worth his salt knows about Morant’s Curve; keeners have visited it at least once; and the real ‘foamers’ know that it is at mile post 113 on the Laggan Subdivision of the Canadian Pacific Railway. (To The Rest Of Us, that’s just a few kilometres east of Lake Louise, Alberta, visible from Highway 1A.) 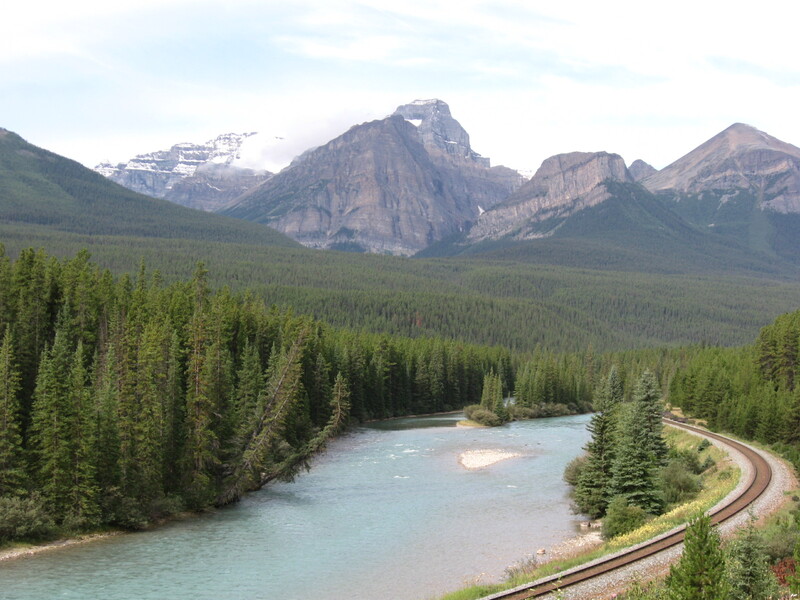 It’s simply a curved section of the railway that follows the Bow River and is set at the foot of the mountains. It’s a beautiful place to take pictures of trains. It got its name from Nicholas Morant, who was the official photographer for the CPR for a large portion of the 20th century. He set up many a publicity shot for the railway along that curve. During this pilgrimage, I waited for an hour each time, and had some great conversations with fellow railfans; I even met one older fellow who knew Nick Morant personally (small world, eh?). But one thing I did not see was a train. I expected to see at least one train, especially on the way back, since we had seen a train climbing The Big Hill east of Field, BC, getting ready to enter the famed Spiral Tunnels near the entrance to Yoho National Park and the British Columbia-Alberta border. We expected to get ahead of that train far enough to get to the Curve and set up for a shot. But the train obviously was held in Lake Louise for some reason. So we saw nothing except beautiful scenery and nice people. Since we didn’t see a train, some folks would wonder, given the hype, if it was all a hoax: that really, trains don’t go past Morant’s Curve, they bypass it by some route not known to us railfans. Not true! Why? Because people I know have seen trains at Morant’s Curve (and, in fact, I saw three trains the last time I visited there). There are witnesses that have confirmed the reality of trains at Morant’s Curve. People likewise wonder if the Christian faith is just a hoax. Because they have not seen Jesus alive, they assume that the resurrection never took place, and that the foundation for being his followers is bogus. But there are witnesses that have confirmed the reality of Jesus, risen from the dead. The whole story of the Gospel of John is the life, death and resurrection of Jesus from the perspective of the apostle John. The apostle Paul, telling the story of his own journey to faith in Christ, recounted that he actually heard the risen Lord Jesus speak to him: “And the Lord told me, ‘Get up and go into Damascus, and there you will be told everything you are to do’” (Acts 22.10b, NLT). We may not see what we are told is possible. But others have, and they give us hope. Next time, I will see trains at Morant’s Curve! One day, I will see Jesus, crucified and risen, face to face. Guess which one matters more? !